A Gothic style church, dating from 1824. It is fully impressive from the outside, with huge flying buttresses, stone string courses, battlements, parapets, pinnacle and dressings. It is fronted by a massive tower with a Gothic pinnacle. But it's a very worn down building – greatly requiring doors to be painted; wheelchair ramps to be added (the main entrance is at the top of a set of steps, and every exterior door is raised from the ground by steps – I hope that some benefactor will choose to finance this important access); and accessible toilets to be installed. I am reminded of the glorious 1920s buildings in Cairo that were effectively left to ruin once Egypt became independent. The interior decoration of the church is as impressive as its exterior. There were several decorative items that would have served better being removed from display, or at least put in glass frames. They seem very proud of their Dunkirk window and victory chapel, which, although wonderful monuments, probably shouldn't be shown off to full effect just before a Sunday service. Banners are on display around the church showing the work of the Sunday school. There is a screen at the east end separating the quire, sanctuary, altar and organ from the rest of the church, but there is a portable altar in front of this screen to bring the service into the main building. There is a small children's area at the back of the church, which is well-equipped with toys and books. There has obviously been a lot of time and money spent here in the past, but unfortunately it's all been left to rot. The walls are in great need of painting; the vestry and toilet area need money to be spent; and it all needs modernising. I think it will be a worthwhile visit for Heritage Open Days in September. 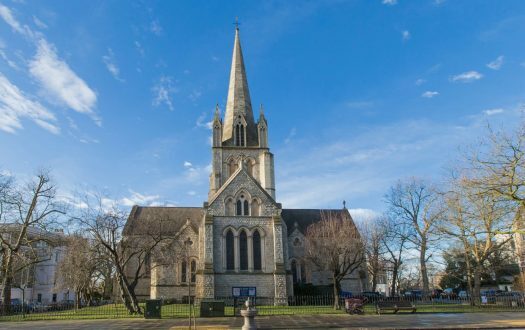 St George's has been hard on luck in recent years – the previous incumbent appears to have allowed the church to become run down before he finally retired at the beginning of the year, and the church is now in interregnum. 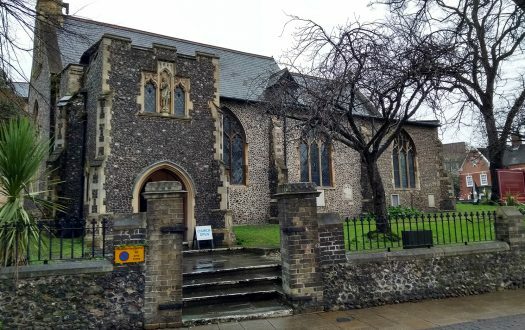 A local retired priest, who is also the town centre priest missioner, has volunteered to look after the church and care of souls until a new incumbent can be installed. I was told that when he took over the congregation had dwindled to only 14, but that it is now between 20-30 on a normal Sunday. This church has so much potential. They hold a weekly (on Tuesdays) free meal for the homeless, poor and lonely in the adjoining church hall. During term-time they hold a Sunday school at 10.00am, restoration and renewal prayers on Saturdays, and a craft group. 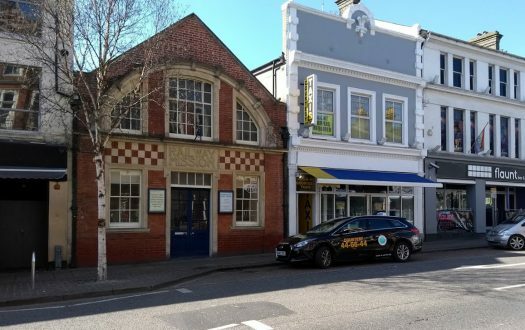 They are also opening in September for Ride and Stride and Heritage Open Days, as well as hosting a charity concert on 29th September by Caritas Chamber Choir. Ramsgate has a long history, with Roman, Saxon and Christian landings. It grew from the hamlet of St Laurence and its fishing harbour became a crucially important port. It was a garrison town for the Napoleonic wars and became a Royal town in 1821. Many of the important buildings in Ramsgate date from the Georgian and Regency period, and the town was expanded greatly in the Victorian era. But nowadays Ramsgate is a typical run-down Kent seaside town. It feels like a small winding Victorian seaside harbour town without the busy-ness that should come along with it. The seafront pavilion is no longer a public building, but a pub, and there are a lot of empty shops and other buildings. Ramsgate does have a few homeless people, which sadly is becoming less of a rarity in Kent nowadays. Our child wanted to help them, so on our way back from the seafront we gave the change that we had left over. Parking appears to be free on Sundays, but is permit parking during the week. We did find it hard to find a spot to park because the streets are very small. There is a Ramsgate Society, which is dedicated to helping make Ramsgate a better town in which to live, work, and enjoy leisure. Although the town is now run-down, I think it has a potentially bright future. The service was led by the priest. Very empty. 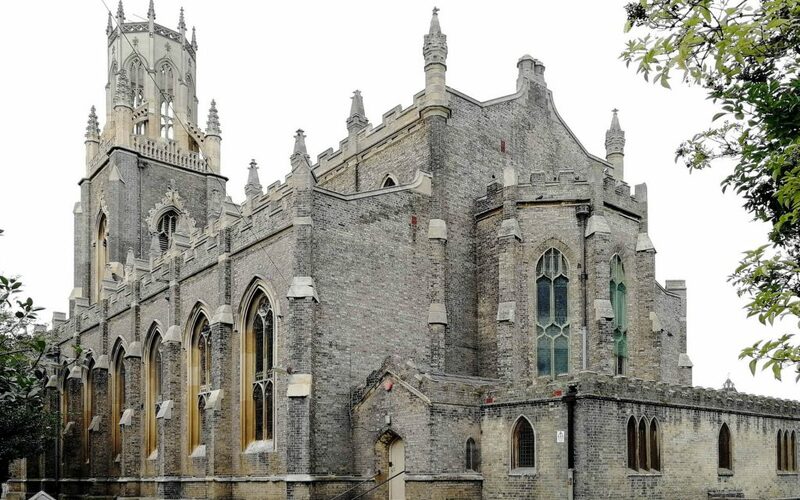 The church was built to seat 1400 people and is enormous inside, with pews taking up most of the floor space and balconies on three sides with further pews. There were 21 congregants plus priest and organist. There was a porch with confusing signage on the doors, but we were greeted immediately we entered the main church by the churchwarden (I believe), who was also acting as sidesperson. I needed to use the toilet and was taken there. When I came out, I found Husband was being shown the victory chapel. Erm. The pews looked quite foreboding but were actually rather comfortable. Continuing the run-down theme, there were long, very worn and threadbare carpets along the pews, which actually might have been better not being there. There was also a threadbare carpet on the route to the vestry. Removing this would make the church look less run-down, I think. The sound system was a bit suspect – apparently the microphone had been mended, but I found it very hard to hear anything, even though there was a speaker above my head. Completely deserted. We arrived at quarter to 11, and the only people there were the churchwarden and one other lady. People drifted in slowly, but I began to panic. Would be just us for the whole service? New English Hymnal. We didn't ask for a music copy (which I regretted when I didn't know the second hymn). A church-produced copy of the order of service (Common Worship Order 1 with proper Lord's Prayer). The four-manual organ, which from our angle really did look like the pipes were falling down. It should be impressive, but it's in great need of an (expensive) overhaul. Even so, it is tuned regularly and was perfectly sufficient for the service. It was competently played by the organist for the most part, although I think the fancy last verses were a bad idea with such a small congregation. The apparent lack of speaker volume, the shabby decorations, and the occasional duff note from the organ were all negative distractions. On the other hand, I was pleasantly distracted by the beauty of the building. I most happily drew in the version of the Lord's Prayer used. I managed to distract the lady in the pew behind us by taking on Child's challenge to stack the church's plastic animals (which, amusingly, had the church's name written on the bottom of each one). It was a good example of middle-of-the-road Anglican: straightforward Common Worship, hymns, communion, no bells or smells. As there is no longer a choir at the church, each of the parts of the service that can be sung were said, which was quite sad but understandable. 7 — The priest is currently running a sermon series on the gospel readings, with today’s being Jesus is the Bread of Life. He spoke clearly, although I wish he had boomed a bit. But he made his points well. I was confused by what I thought was a sermon preamble, but he joined the threads together eventually. One thing I was most pleased by was that he provided typed notes (including the readings and website links for further reading) of the sermon for congregants to take away with them. I wish more churches would do this. Jesus talked about the Old Testament manna from heaven and how he would provide everlasting life for his followers. This was seen as blasphemy and revolution by the leaders at the time. The leaders were outraged by Jesus' claim that he was the Son of God, and that he was there to save them and give them a place in heaven. The doctrine of the Transubstantiation holds that the bread and wine become the actual flesh and blood of Jesus. What an amazing idea this is. [I couldn’t quite make out whether the priest personally believed in it.] This is a phenomenon known as spiritual metaphysics, where the boundaries of spiritual and physical become unclear. The traditional Lord's Prayer and the interesting points raised in the sermon. The lack of singing – the congregation tried, but I just felt like there was something missing. And the sound system was pretty dire. We were grateful that we were left to listen to the organ recessional without interruption, but after that we were greeted as soon as we left our pew. We made our way to the back, and we were able to purchase a magazine. We were also given further information about the church after asking for it. A couple of people engaged us in conversation, and eventually we were invited to drinks in the church hall. I felt this was a bit confusing – if we hadn't hung around, I don't know if we would have been invited, and it was quite hard to find the room in the hall once we made our way over there. It was very nice, served in proper mugs, and we were encouraged to make it to our own strength. There were three biscuit tubs on the table, but it took us a little while to get the courage to ask if there were biscuits in them. Once they had been opened, we were allowed more than one biscuit each! “You can have more if you've finished that one,” we were told. We all sat around one big table, and the conversation was very useful. 9 — I would say that the welcome at the beginning of the service lacked warmth, but after the service we were made to feel very welcome. (If we hadn't been Mystery Worshippers, we might not have stuck around for this, though.) Their website is merely a placeholder – it seems to have expired. We found it very hard to find the service time, and I only found it eventually by spotting a photograph of their notice board posted by a random person on Facebook. How much the church needs to be improved – not only the physical plant but also the size of the congregation and publicity. It does seem that the current congregation really wants this to happen, and I think they will make it happen.